In many parts of the world, it is too hot for comfort for at least part of the year. 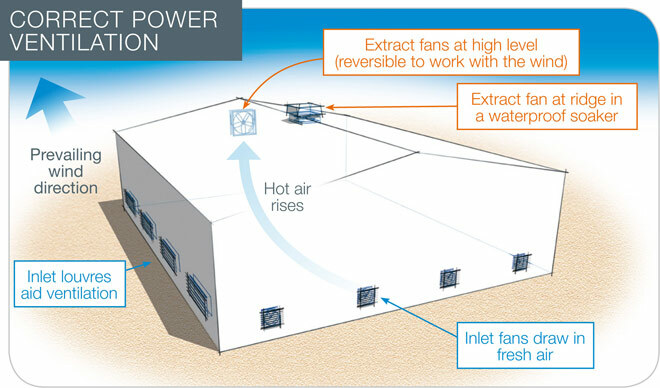 It is rarely cost effective to air condition the entire large volume of a building, so what is then needed is natural ventilation using air vents and covers to reduce the discomfort. This can be provided by directing the predominant wind through the building. Air feeds in at low level on the windward end but wind can be a letdown, because on the very hottest days there is sometimes no wind; and because the prevailing wind can change with the seasons. The best way then is not to rely on the wind (but to take advantage of it when it is there) and to use natural ventilation in the most effective way. 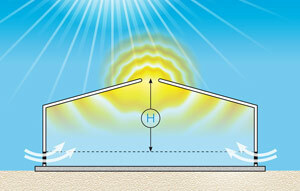 Sun heats the sheeting, which radiates heat into the building. Conduction heats the air inside and the hot air rises. The hot zone extends downwards during the day. 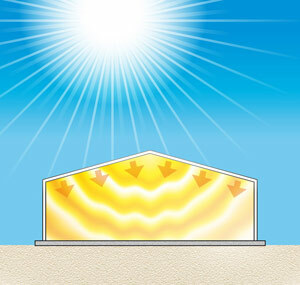 A white roof - white can warm to 50oC. Black, Dark Green, Dark Red will warm to 110oC ! Double skin roof insulation - can reduce radiant heat and also reduces rain noise 30 times! Light coloured external walls. Less vital than the roof, but still adds to comfort. White internal liner - reduces radiant heat and reduces need for too much lighting. Let the hot air out at the top . . . let ambient air in at the lowest part. Venting at the roof and on the walls allows natural air circulation which gets rid of the hottest air and so prevents heat build up. It also cools underside of roof so reduces radiant heat. The amount of air circulation depends on the "chimney height", H which is the distance from the roof vent to the top of the wall venting. The bigger the value of H the better the circulation. However a roof vent needs a cover, and a simple cover can be susceptible to wind forcing air back down into the building and letting in rain as well as attracting birds to nest. The REIDsteel ridge vent with cowl and bird mesh. 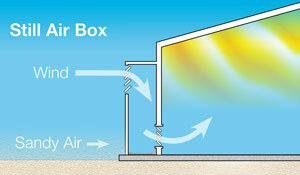 This design guarantees suction to draw heat out of the building with any wind direction. 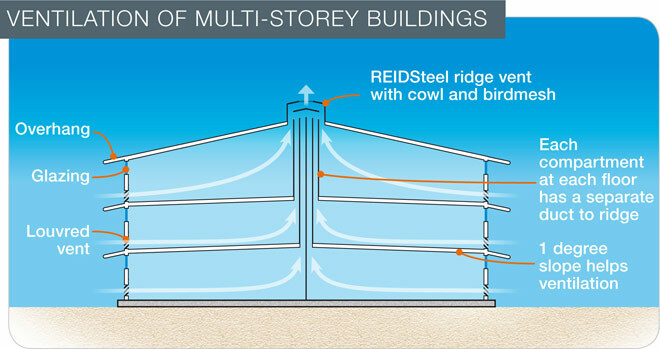 Ventilated block and/or REIDsteel louvres on the building sides. Shutters can be added to the louvres to prevent sand ingress. Still Air Boxes - Sand and water ingress can be prevented further by using still air boxes on the windward side. Air enters these at high level but enters the building at a low level to keep the 'chimney height' to a maximum. Roof Overhangs can be combined with high level translucent sheeting and/or glazing to allow some natural light in without any solar heat gain. 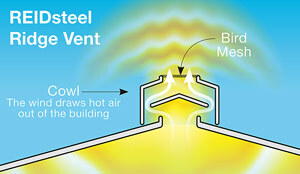 The sheeting/glazing should not allow any ventilation at the eaves. No! Chimney height is reduced to nothing, natural venting is reduced, roof gets hot, no circulation near people. No! Chimney height reduced, hot air still builds up. And low level vents stopped. 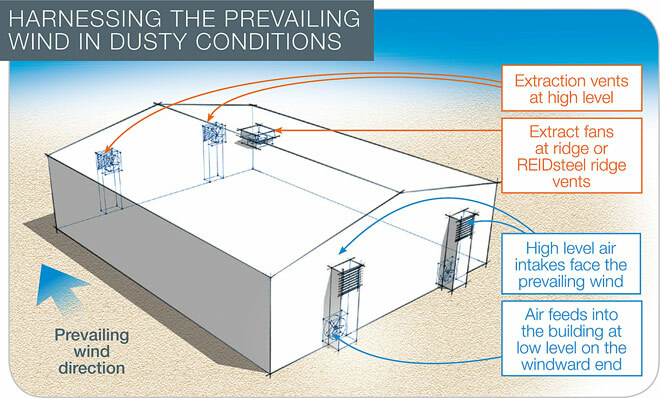 Ventilation can be forced using fans, inlet fans or exhaust fans. If used, these need to be correctly positioned, well maintained and cleaned. In addition, they constantly use expensive electricity, make a noise and frequently add to discomfort with draughts and unequal ventilation.